A man in his 80s has been charged with murdering his wife. Michael Hubbard, who has been detained under the Mental Health Act at the Norvic Clinic secure unit in Norwich, was charged by the city's magistrates on Monday. 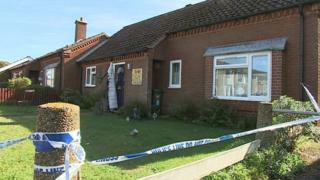 The body of Hilda Frances Hubbard was found by police with fatal stab wounds at a house in Churchill Place, Brooke, Norfolk, in September. The 81-year-old is next due to appear before magistrates on 15 May.